At the Powder Room you can relax and trust our friendly team to spoil you in the comfort of your home, hotel or at our spacious modern studios in New Farm, Brisbane. “We are your best friends on the best day of your life”. Your stylist is a highly trained, industry professional. We only use the finest quality products such as Mac, Laura Mercier, Nars, and many others. 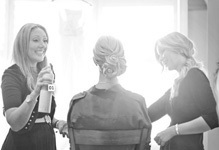 The Powder Room is Brisbane’s longest established bridal studio being in operation for more than 10 years. Trust the experts to create your dream wedding look.